Who knew that death could be so cute? Tony Fleecs shrinks comic book heroes down to size, turning their most tragic moments into something weirdly adorable. 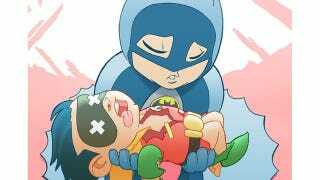 I can't decided if chibi Jason Todd and thumb-sucking Jubilee make these moments more or less disturbing.